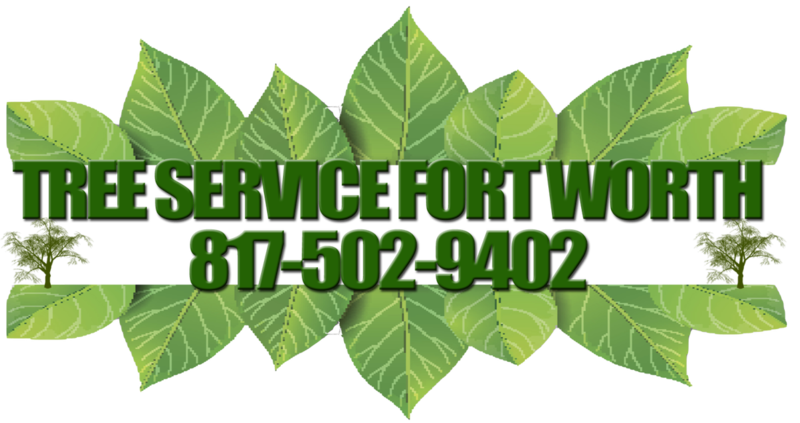 Tree Mulching Services in Fort Worth, TX. The best thing to do when laying mulch is to call a professional in this field to ensure the job gets done right. Never the less, for you do-it-yourselfers, here's a great and correct way to lay mulch down at the base of your trees. Identify one good trunk if you have shoots, extra trunk growths, take the best one and cut the other. Once you have a trunk established use your garden tools to clear off all weeds, grass, and debris in a circular motion around the tree base. Make sure not to accidentally cut the base of tree or roots with garden tools. 3. Inspect area really good to get all weed roots, don't be afraid to pull out from ground, bringing all the roots out and avoiding future growth. 4. Your circumference around the base of the tree should be made to the water drop of the tree branches. (These are the branches that start to bend downwards on the tree). So when it rains it won't fall directly on your mulch from the drip line of the tree, this is avoiding over saturation and mulch washing away in storms. 5. This is where most tree services and landscaping companies miss it. DON'T PUT MULCH NEXT TO TREE TRUNK. Avoid this at all costs, although it looks cosmetically proper its not, and will result in moisture trappings that will rot the wood with time. Its also a good place where insects will lay eggs and tree disease will incubate. How should I apply mulch to tree base? When you have your circumference around the tree set up correctly. Then you are ready to start laying down your mulch. Cart wheeler to put mulch into. Rake to move and spread mulch evenly on circumference. Old news paper to lay down around base. Special note don't use any chemicals to kill weeds in the circumference area. Just do your best to remove weeds by the roots, water if needed, wait a while then clear free of roots. If any of the trees roots are showing use organic dirt from your own yard to cover first. Optional step: use old news paper laying multiple layers down on the ground first around circumference area. This will help prevent new weeds from growing in the future. New paper is safe and is made from the same materials at mulch, the great thing is that its biodegradable. 1. Pour Mulch into wheel cart. 2. Use shovel to apply directly into circumference area. 3. DON'T pour all of wheel cart into area, use shovel to transport. 4. Using rake start to spread Mulch evenly in a circular motion covering circumference. 6. Using a ruler level mulch around tree to a depth of no more than 3". 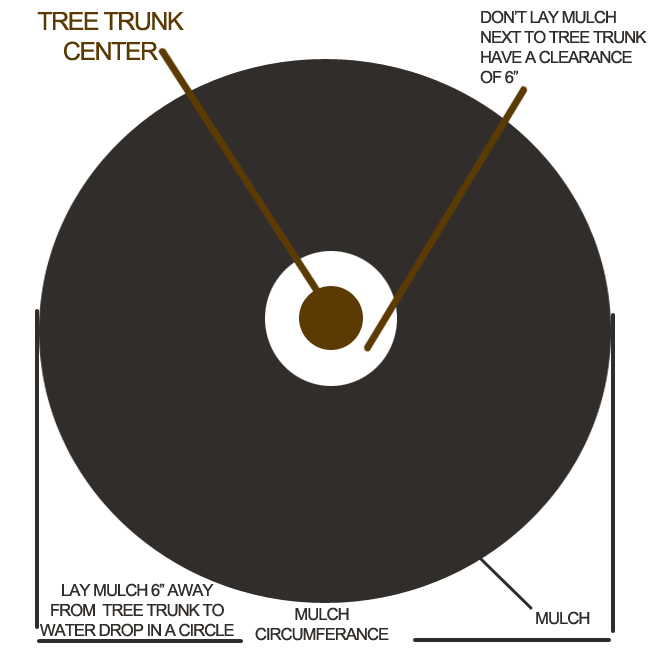 Optional step: depending on your liking, you can add a boarder around the circumference area. When applying mulch please keep in mind that more is not better! Anything in excesses of 3" will not work in the long term for the over all health of the tree. Roots not being able to get the nutrients they require and tree dying. 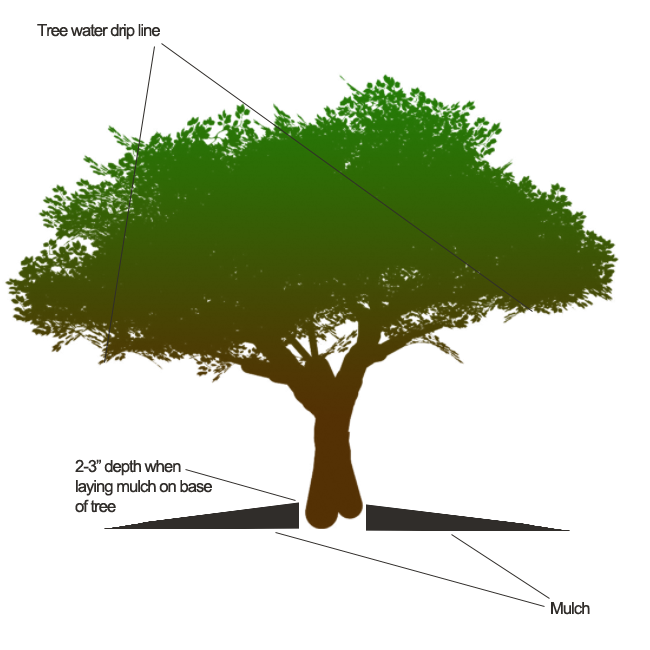 Tree will have to grow a separate root system closer to the surface for the lack of oxygen. This will result in tree not being able to grow correctly. 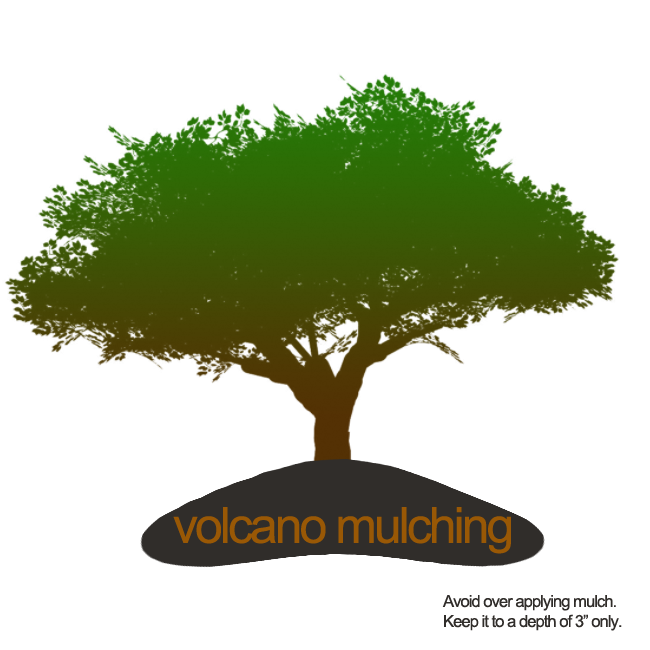 CHOOSING THE RIGHT MULCH FOR YOUR JOB? Q: How much much do I need? A: Depends on how big is your job. Normally 2-3 regular bags of mulch per tree. Q: Will mulch attract insects? A: No more than what would have been there without it. Q; Will hardwood mulch attract termites? A: No it will not. The same chance as your house attracting termites, some people get them some people don't mulch doesn't increase your chance. Q: What's the best kind of mulch to use on trees? 1. 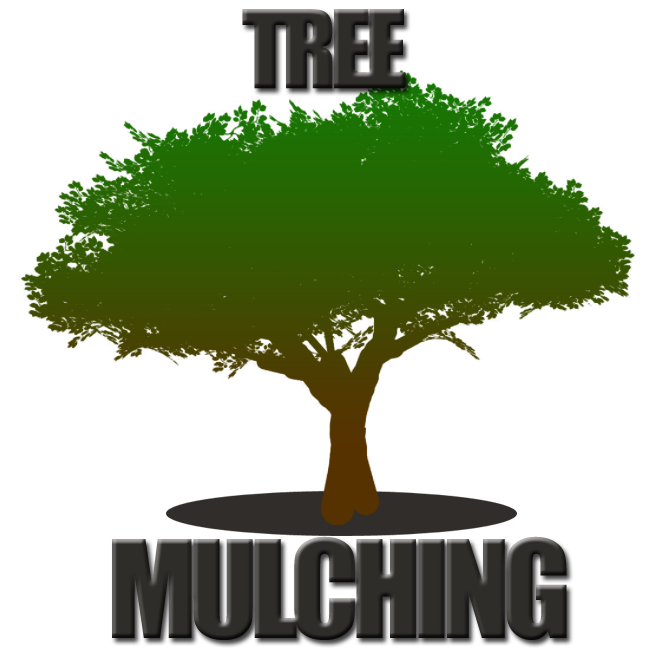 Courser mulch: is best for large areas and trees. 2. Medium to fine mulch: is best for shrubs and flowers. 3. Wood chip mulch: is best for play grounds and back yards.